Last week, we had another big milestone in our family life. After last year's first quick camping trip at Pinnacles, we went camping for 2 nights for the first time. And it was a great success. 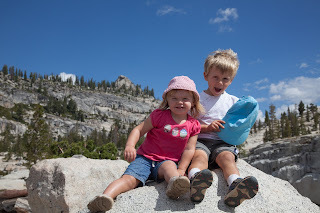 We were lucky to get a reservation at a campground in Yosemite, on a weekend where the weather was perfect, if not a little too hot. We spent a weekend exploring the valley, hiking, looking for wildlife (not very successfully though) and enjoying the outdoors. It was fun! Even though Daniel had a short phase of accidents after a long hike to the top of Bernal Fall (bitten by a squirrel - or so he thinks, and a fall leading to a cut gum), he quickly recovered and enjoyed the rest of the trip. A few minutes later, he was again climbing on boulders, running around, and enjoying being outdoors to use his endless energy. The hardest part was leaving. Everyone was heart-broken, but Daniel had the hardest time. It seems to be a pattern for him lately, and I think this had to do with the age (although he already showed similar behavior at 18 months) . Daniel is so passionate about everything, and he loves new adventures. Even though we keep telling him and finishing an adventure means that a new one will be starting soon, he still has a hard time saying good bye. Fortunately, a few days later, we were on our way to a great trip to Europe. So the Yosemite nostalgia was limited. And we have another camping trip to look forward to in a few weeks, which should be a great way to wrap up the summer.